The Alaska Humanities Forum and the Alaska State Council on the Arts announce Rob Sparks, Soldotna Prep, is the 2017 Governor's Awards for the Arts and Humanities, Alaska Studies Educator of the Year! "This honor came as a complete surprise to me," said Rob Sparks. "I've been fortunate to have the support of administrators and colleagues who support some of the unique approaches we take studying Alaska in my classroom. Special thank you to Greg Zorbas for the collaborative work we do and the videoconferencing skills which have allowed me to connect my room to other Alaska classrooms. It is an honor to be recognized as a teacher who is trying to make a difference! Mr. Robert Sparks has been an outstanding Alaska History teacher at Skyview High School and Soldotna Prep School for well over a decade," said Curtis Schmidt, Soldotna Prep principal. "His influence on the lives of KPBSD students is immeasurable. In the past nine years I have worked with Mr. Sparks he has transformed his curriculum and teaching methods into a classroom without walls (CWOW) in order to increase student engagement, interest, and connection to Alaska and the many communities and cultures that exist within the state. 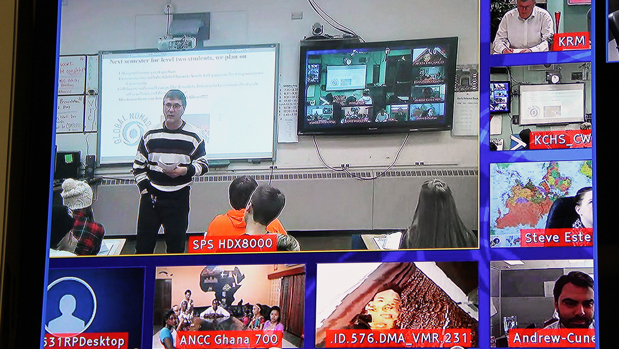 He has been recognized locally, statewide, and nationally for his efforts (see his website) to incorporate video conferencing into his classes, which include Alaska History. He uses this, and other online technologies to connect his students with other students around the state and the globe to develop a better understanding of what it means to be "Alaskan." Sean Dusek, superintendent, said, "Mr. Sparks continues to be a great teacher and seems to get better with age. This is another well-deserved award and I truly appreciate his passion, commitment to continuous improvement and the positive difference he makes for kids every day." The Governor's Awards for the Arts and Humanities is an annual partnership between the Alaska Humanities Forum, the Alaska State Council on the Arts (ASCA), the Alaska Arts and Culture Foundation, and the Office of the Governor to recognize and honor noteworthy contributions to the arts and humanities in Alaska. The awards recognize Alaskan artists, educators, historians, and institutions for their enduring impact on people and communities across our state. The Governor's Awards ceremony will be held in Juneau on January, 26, 2017 and is open to the public to attend – further details and tickets are available at akgovawards.org.